My old good friend Janet is part of a team that is providing food for the Olympic athletes and media reps. I haven't seen her in ages because she has been in China for over a year preparing for these two weeks. The New York Times had an article about this initiative which I have posted below. Thanks NYT. 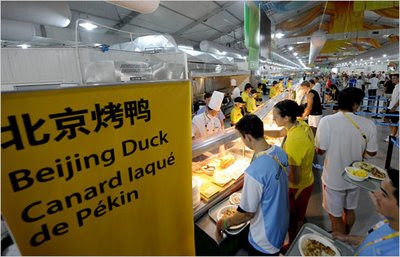 BEIJING — The Olympic Village dining hall is the size of three football fields — large enough to seat 6,000 people at one time. And the food operation needed to feed a multinational, multicultural, multilingual base 24 hours a day is equally vast in scope. A Philadelphia-based privately held company, Aramark, is handling the food for the Olympic Village, two Media Centers and two Media Villages during the Olympic Games — its 14th Summer or Winter Games since the company first had a contract for the Mexico City Games in 1968. In order to satisfy a diverse and demanding set of palates for the 28,000 athletes, coaches and staff at the village, the chefs at Aramark have designed a menu that features 800 recipes from all around the world that accommodate all sorts of dietary needs — vegetarian, Halal, kosher. The eight-day menu rotation has an Asian bent, specifically with a focus on Chinese specialties including Peking duck, congee and shaved noodles, but it also has dishes from Italy, Greece, Northern Africa, southern Spain and Latin America. Not to mention the cheese, lettuce, onions, chickens, and oranges. A funny comment she made in an email recently (not food related) was that in Athens when Yao Ming came to the dining hall and sat down, his knees were above the table. Hard to enjoy a meal that way!